Three years after Noir, Bee Train returned with spiritual successor Madlax. The series would end up being the second in a trilogy of anime based around “girls with guns” and while many of the elements that the studio had utilized in Noir reappeared here the end result was a very different show. Unlike its predecessor’s episodic approach, Madlax goes for a slower methodical story that is a much slower burn. Some viewers may not have the patience to make it to the point where the mysteries start to become clearer, but those who choose to stick it out will find that Bee Train has told a more complete narrative than is typical for an anime of this type. Madlax’s story takes place in Gazth-Sonika and Nafrece, two countries that are vastly different. Nafrece is a peaceful country that had enjoyed a long period of relative stability, while Gazth-Sonika has been through a lengthy civil war that seems like it might never end. The titular Madlax is a mercenary who works in Gazth-Sonika and takes jobs that often seem to be tied directly into the events prolonging the war. She’s a young girl that has a superhuman level of ability when it comes to taking out any enemy that might stand in her way. But despite her high success rate, Madlax is fairly detached from the atrocities of war and sees the violence around her as a normal part of everyday life. The first half of the series focuses on the missions that she is assigned, which range from escorting normal citizens through the warzone to assassinating high ranking officials in the Gazth-Sonika military. She also makes a rival out of Limelda, a talented sniper in the military who becomes obsessed with taking Madlax out after failing to stop an assassination attempt. Whenever the focus shifts over to the civil war and the events taking place within this chaotic country there is a considerable amount of action, and Bee Train continues to showcase their knack for flashy yet bloodless battles during these moments. In between episodes that highlight Madlax and her assignments in Gazth-Sonika, the story focuses on Margaret Burton and others living in Nafrece. As Nafrece is a very different country that’s very peaceful, the tone shifts considerably during these episodes and almost takes on a slice of life feel early on. Margaret is a schoolgirl from a wealthy family who lives with her maid Elenore, and while she initially seems like a withdrawn, spacey person it is revealed that this is mainly because of some prior traumatic experiences. Margaret is missing the majority of her memories from years prior, as she had traveled to Gazth-Sonika with her mother and disappeared for quite some time before suddenly reappearing at her estate with no recollection of how she got there. The only word she was able to say when she returned was “Madlax,” making it clear that there is some kind of connection between the two women. Margaret’s days are spent in peace with Elenore serving as a guardian that protects her from any potential danger. A little ways into the series her next door neighbor Vanessa comes into the picture, and this is where the two countries start to intersect. Vanessa works for Bookwald, a large corporation that she discovers has been funneling a considerable amount of money into Gazth-Sonika and may have some influence behind the prolonged civil war. Compared to Noir, Madlax spends a lot more time building up the mystery behind all of its events and many that initially seem unrelated eventually intersect. But it’s also much slower to get going than its predecessor, and the way that the narrative unfolds may cause some viewers to drop this one before it fully reveals all of its secrets. The reason for this is that while it’s obvious from the beginning that Margaret and Madlax’s worlds will eventually intertwine, it takes almost three quarters of the way through for that to finally happen. Because of this, early on it isn’t unusual for an entire episode to be action heavy and focus on Madlax’s ability to tackle a tough assignment while the next is completely devoid of action and focuses on Margaret’s ordinary day to day life. I did find a couple of episodes right before the halfway point where my interest started to waver a little bit, but I was intrigued by what might be tying the two main characters together and pressed onward. If you make it beyond some of the episodes that lag during the first half of the series, your patience does pay off. Compared to Noir there is an even greater web of mystery and intrigue at work here, mixed with a healthy dose of supernatural elements. As the plot progresses, it becomes clear that there’s an organization called Enfant manipulating events from the shadows by controlling technology around the world. Bee Train clearly has a thing for mysterious organizations that control the world from the shadows, as Noir had the Soldats as a similar antagonist, but the difference here is that the veil of mystery is eventually lifted and there’s a very clear enemy in Madlax. There are also some supernatural/fantasy elements at work, as Margaret possesses a mysterious book that everyone seems to be after and it seems to grant some power of some kind to a select few. I don’t want to give too much away about where the plot goes with these different elements, but it’s worth sticking with it as once everything came together I couldn’t stop watching. Every little detail that seemed unimportant early on eventually ties in, and as the mystery behind what has prolonged the civil war in Gazth-Sonika and how that relates to Madlax and Margaret becomes clear the plot becomes even more compelling. But what I like the most about this particular series is that it tells a complete narrative. Quite a few of the anime that is greenlit is based on a manga or light novel and at the mercy of the available storylines, or wraps things up with a non-conclusive original ending. 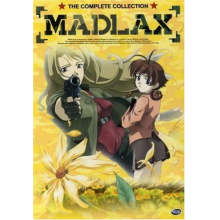 Madlax didn’t have this to contend with, so not only are all of the little threads in the mystery addressed before the end but it feels like it tells a complete story and not only explore the supernatural elements that are introduced but lets the viewer learn a significant amount of detail about the main characters. This is another element that drew me in, as the interpersonal relationship between the primary cast grows over time and as more details are revealed about their pasts it’s easy to feel connected to them. In particular, a later arc finds Vanessa traveling with Madlax and the two establish a kinship despite their very different backgrounds that’s compelling to watch. Bee Train went for a very similar animation style to Noir, and even though three years separated the two projects Madlax’s animation makes it feel like a follow-up. Unlike a lot of the action-centric anime out there, the color palette here is fairly muted and there is a more realistic feel with some added flashiness during the gunfights and some of the fantasy oriented sections. With the exception of a few scenes fan service is kept to a minimum, and while there aren’t a lot of individual elements to the animation that will particularly wow the viewer there aren’t any obvious flaws either. This allows Madlax to be driven by its plot first, with the animation serving as a means to tell the story rather than being an artistic showcase. Viewers will likely find this to be true of the audio as well, as the background music stays fairly soft throughout most of the scenes but kicks up slightly as the action picks up or a clue to the mystery is presented. Yuki Kajiura’s compositions are very similar to what she wrote for Noir, but it works just as well here and there are some occasional flourishes of chants and mantras during some of the songs that add to the supernatural/fantasy theme. Voice acting also seems a bit more subdued compared to some of the other action anime out there, but it makes perfect sense for a story that’s more serious in tone and has two lead characters who are detached from the situations they are in. Madlax took a lot longer to get going than Noir, but the slower methodical approach paid off in the end and the story proved to be truly compelling. There’s a larger central cast woven into this tale of mystery and intrigue, and Bee Train has delivered an in-depth look at how different people are affected by war accentuated with some fantasy/supernatural elements. It may prove to be a bit too slow paced for some and the lead characters are sometimes just a little too detached and aloof from reality, but if you’re interested in a more mystery oriented action series and are willing to deal with the pacing there’s still a lot to like about this one.